On Tuesday January 9th, 2018 at the Athens Hilton Hotel, took place the 3rd European Economic Forum themed “The Greek Economy in crossroad: opportunities and threats” in the framework of the Money Show. One of the main pillars of the conference, because of the influnce and impact on Greek economy, was not only the presentation of the Policy Paper of RESTART Project, but also the discussion between the speakers as stakeholders, IRTEA and with the participation of more than 150 participants. Among them there were young students, volunteers, Academics, members of the civil society, NGO members, as well as employees in the public and private sector. The speakers that honored us with their presence were Mr. Staikouras Christos, Member of the Greek Parliament with New Democracy Party, former Assistant to the Minister for Economics 2012-2015, and Assistant Professor of Accounting and Finance of the Economic University of Athens; Mr. Konstantinopoulos Odysseas, Member of the Greek Parliament with Democratic Alignment and former Assistant to the Minister for Growth and Competitiveness; Mr. Kotios Angelos, Rector of the University of Piraeus, Professor at the Department of International & European Studies and Director of the International and European Policies and Development Programmes Lab; Coordinator of the Conference was Mr. Dourakis Vaggelis, Journalist at Radio Alpha 989 & Alpha TV. 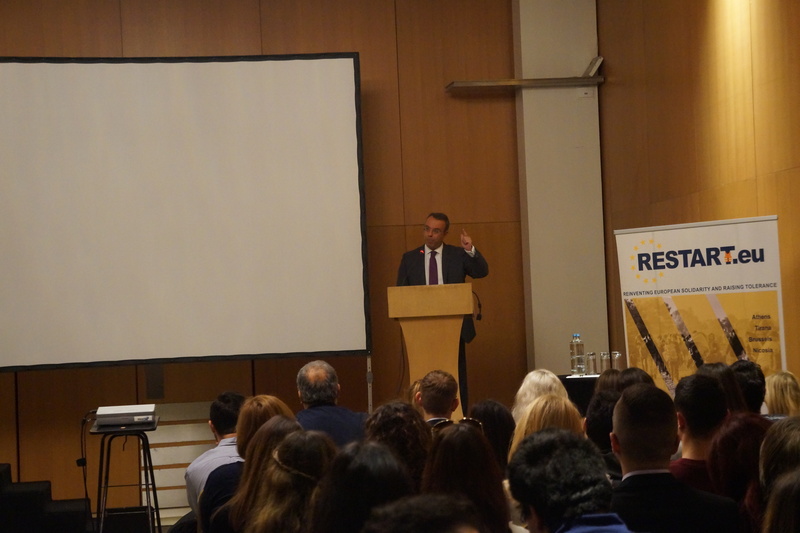 The President of the Executive Board and Co-founder of the Institute of Research & Training on European Affairs – I.R.T.E.A., Mr. Antonakakis George, presented to the audience the funded from the European Union Project RESTART and informed the guest speakers about the activities that were implemented. The recommendations that were made by the participants of the Pilot Activity of the Project, as well as from the participants in the previous phases of the Project, on the amelioration of the situation caused by the refugee crisis in Europe impressed the speakers. They expressed their pleasure that young people are engaged to voluntarism, which-unfortunately- is not widespread or established in the Greece society. In addition, the speakers commented on the recommendations and the outcomes of the Project, underlining that decisive and meaningful measures must be taken on behalf of the local, national and, more importantly, European authorities, in order to improve the lives of the refugees that stay in our country, as well as integrate them in a non xenophobic society. They, also, declared their support to the Project and the coordinators in every similar initiative. Last but not least, the attendees of the conference had the chance to comment on the Policy Paper and exchange views with the guest speakers on the current situation of the refugee crisis and the measures that should be taken. The conference ended with the best comments from the speakers and the participants, as well as with their best wishes on the upcoming presentation of the Policy Paper to the Greek Members of the European Parliament (MEPs) at the end of the month, hoping that the voice of youth will be heard by the European policy makers and make a change in the route of history.